Primeasia University was founded on an agenda of social responsibilites to provide higher education to all.Since higher education is the most effective tool to meet today’s diversified social challenges including population explosion, illiteracy, poverty, food insecurity, and depleting naturally endowed resources while, side-by-side, entrepreneurship, leadership, and good governance in the society. It is a key to intellectual growth that allows one to develop new models and standards and to be guided by strong moral reasoning, ethics, dignity, and enthusiasm. A high quality education for all can be ensured by establishing nationally and internationally competitive environment for research and education where scientists, engineers, and entrepreneurs, can maximize their potential that would, in turn, facilitate economic growth and development of the society. Primeasia University places emphasis on the need to develop research capacity and the application of research activities to social development. Primeasia University aims at establishing institutional arrangements for assuring, developing and monitoring the quality of research and education. In Bangladesh, large numbers of public and private universities have been established. However, the increase in the universities’ number, students, and faculty do not appear to have been reflected in a similar increase in the quality of education. Primeasia University emphasizes that higher education is critical for advancing knowledge and improving the lifestyle of the community, and as such, combines academic excellence with an innovative and entrepreneurial approach to research. Primeasia University plans to bring the best educational technologies to satisfy the individual and community needs. Primeasia University places utmost importance on strategic planning for quality assurance that constitutes all planning tools to formulate the university mission, vision, objectives and action plan to implement quality education. Primeasia University aims to establish a high degree of professionalism, objectivity, and commitment, and to monitor quality of education through periodical meetings, peer reviews, external and internal assessments and feedback from current students, parents, past graduates, and related stakeholders. 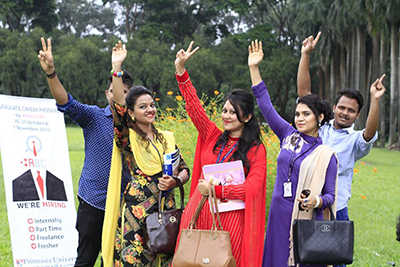 Primeasia University’s role in channelizing the human resources in education and services has become exemplary; since its inception in 2003, the University’s growth has been phenomenal due to such continuous efforts of improving the teaching-learning environment by taking various measures. With the current enrollment of about 5000 students and about 200 faculty members, Primeasia today, is in a distinguished position to issue this prospectus to not only analyze the current academic quality in higher education but also to ensure that the Primeasia will continue to upgrade the infrastructure to meet the changing needs of students and employers. This website has incorporated the detail information for all degree awarding disciplines and academic programs/ departments that would be useful to know about studying at Primeasia University. The readers and viewers of this site would also find vital information about the people within university, administrative and academic services, updates of the news and events that happens across the institution, detail information for the prospective students, career guidance for the existing students, university rules and regulations, and a detail database of alumni directory.